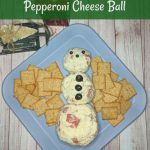 This delicious pepperoni cheese ball recipe will be sure to delight your guests. Take it to family gatherings, and people will be asking you to bring it again! 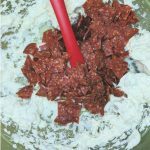 Place softened cream cheese and dry Italian dressing mix in a bowl and beat until blended. 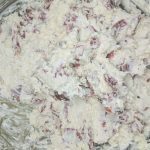 Mix with a spoon until everything is incorporated. 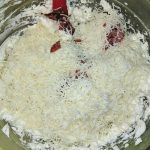 Roll cheese ball in Parmesan cheese right before serving. I didn't use olives, and I didn't roll it in Parmesan cheese because I'm not a huge fan unless it's on spaghetti. You can make this your own for sure.